Introduction. Organizational Considerations. Assessment of the Patient with Acute Pain. Pharmacology of Opioids. Pharmacology of Local Anesthetic Drugs. Non-Opioid and Adjuvant Analgesic Agents. Routes of Systemic Opioid Administration and Titration. Patient-Controlled Analgesia. Epidural and Intrathecal Analgesia. Other Regional and Local Analgesia. Non-Pharmacological Therapies. Acute Neuropathic and Persistent Postacute Pain. 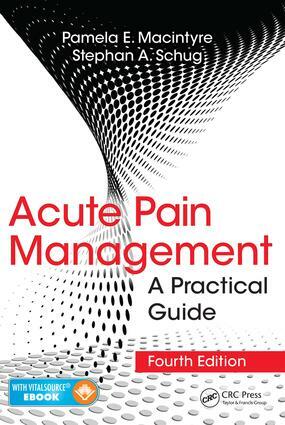 Non-Surgical Acute Pain. More Complex Patients. Acute Pain Management after Discharge. Self-Assessment Questions. Pamela E. Macintyre, BMedSc, MBBS, MHA, FANZCA, FFPMANZCA, Director Acute Pain Service, Department of Anaesthesia, Pain Medicine and Hyperbaric Medicine, Royal Adelaide Hospital and clinical associate professor, Discipline of Acute Care Medicine, School of Medicine, University of Adelaide, Australia. Stephan A. Schug, MD, FANZCA, FFPMANZCA, Professor and Chair of Anaesthesiology, Pharmacology, Pharmacy and Anaesthesiology Unit, School of Medicine and Pharmacology, University of Western Australia and Director of Pain Medicine, Royal Perth Hospital, Australia.